WPLGA FLYERS - Interested in playing a WPLGA Association play day?? CLICK HERE for the monthly playday courses, costs, etc. NOTE: Entry Fee for Monthly Association Day Tournaments have been increased by $5.00 effective January 1, 2013. ELIGIBILITY: In accordance with TVWGC Standing Rules, participants must have played 6 play days within six months prior to the tournament date. WINNER: 3 DAY LOW GROSS OVER THE FIELD within the Senior Championship (regardless of flight. ONE-THIRD OF THE FIELD FROM EACH TOURNAMENT WILL BE PAID. Winners will not receive more than one prize. TIES: In case of tie for Club and/or Senior Champion, there will be a sudden-death playoff immediately following play of final round. A tie for any other position will be carded off in accordance with USGA procedural recommendations. IF YOU HAVE NOT HAD THE OPPORTUNITY TO ATTEND A RECENT RULES SEMINAR, THE LPGA HAS PROVIDED A HANDY, SHORT AND TO THE POINT GUIDE TO ASSIST YOU IN LEARNING THE NEW RULE CHANGES. TO OBTAIN YOUR PERSONAL COPY OF THE MAJOR HIGHLIGHTS IN RULES CHANGES, CLICK HERE TO DOWNLOAD A COPY COMPLETE WITH ILLUSTRATIONS. ONCE YOU HAVE HAD AN OPPORTUNITY TO FAMILIARIZE YOURSELF WITH THE MAJOR CHANGES ANDYOU HAVE ADDITIONAL QUESTIONS, YOU MAY CONTACT THE RULES CHAIR, PAT GALLAGHER FOR FURTHER CLARIFICATION. The Relief Area is the area where a player must drop a ball when taking relief under a Rule. This area is measured from a Reference Point, the starting point for measuring every relief area. The Relief Area is a defined area that is measured with the longest club carried by a player, other than a putter. No matter what club is used to measure, and even if an estimate is made by the player using no club, the ball must come to rest within the longest club, other than a putter. Using a putter or sand wedge will not provide a smaller relief area. The one club-length Relief Area will be uniform for all procedures, except when a player is using the two club-length "Lateral Relief" option from a red penalty area or from an unplayable ball. This change makes the Relief Area consistent. No matter if a player is dropping a ball from an immovable obstruction, from an embedded ball, from a wrong putting green, when going back on the line relief under penalty, or when using the stroke and distance option under penalty, the Relief Area is one club-length not nearer the hole. When taking free relief or penalty relief, a substituted ball or the original ball must be dropped in the relief area. · ALWAYS CARRY A SECOND BALL. · DON’T FIGURE YOUR SCORES AT THE GREEN; DO IT AT THE NEXT TEE. · WHEN SHARING A CART, TRY TO PARK BETWEEN SHOTS AND HAVE EACH PLAYER WALK TO HER BALL. · NO SEARCH PARTIES, MEANING THE ENTIRE GROUP DOESN’T NEED TO PURSUE A LOST BALL. LET THE PLAYER AND ONE OTHER LOOK WHILE THE REST LOCATE THEIR BALLS AND PREPARE TO PLAY. 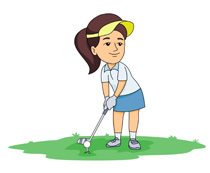 · IF THERE’S DOUBT ABOUT A BALL BEING LOST, PLAY A PROVISIONAL TO AVOID HAVING TO GO BACK TO REPLAY THE SHOT. · CURB YOUR PRE-SHOT ROUTINE IF IT INCLUDES EXCESSIVE PRACTICE SWINGS. THE PROS DON’T NEED EIGHT PRACTICE SWINGS; YOU DON’T EITHER. · ON CART PATH-ONLY HOLES, TAKE MULTIPLE CLUBS TO YOUR BALL. · START READING YOUR PUTT AS SOON AS YOU WALK ON THE GREEN. ONE OF THE BEST WAYS TO READ A PUTT IS FROM THE LOWEST PART OF THE GREEN. START THERE AND WORK TOWARD YOUR BALL. We want to learn to play better golf and hit better shots. There is one skill in the game that does not take any talent – etiquette. These simple guidelines will keep you in good favor with your fellow playing competitors. KEEP UP: Fast golf is fun golf and you don’t have to be good to be fast. · Putt out your tap-ins – every time. · Take two clubs with you from the cart so you don’t have to make an extra trip when you realize the wind direction has shifted. · Always pay attention to your fellow golfers. Don’t make noise while they are hitting. · Write down your scores when it’s NOT your turn. · If you cannot see the group in front of you, your group is behind pace of play. KEEP QUIET: Knowing when to chat and when to play is important. · The safest place to be is to the rear and on the “belt-buckle” side of the player and at least 6 feet away. Any of the other three quadrants are susceptible to sculled shots, shanks and flying equipment. · Pay attention to your fellow golfers’ shots. · Never stand on or behind the line of a shot, especially on the putting green, and be aware of everyone’s position on the green before accidentally stepping on their line. · Try to leave the course better than you found it. · Leave the rakes on the outer edge away from the green. · Repair divots. When you sand divots, smooth the sand over with your foot to make the ground smooth to allow a ball to roll through the divot without getting stuck. · Repair ball marks by replacing the middle of the ball mark with the surrounding healthy grass. You should be pulling in the grass, not lifting up.